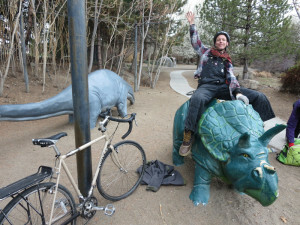 Urban bike culture in Salt Lake City is dwindling. I can see the climate’s changed from the peripheral eye that peers over the digital echoes of community. The focus is on commuting and initiatives, on riding long and hard up canyons in the name of self-improvement and taking Sunday rides with groups of like-bodied lycra-lovers. Of course, the drunken rabble-rousers of the city will never go away, no matter how many mouths are relying on them to make it through the ride alive—but there used to be a middle ground that appealed to everyone. James Miska is a local man intent on bringing back that middle ground, where adventure toes the line and breaks some rules, but it’s definitely not getting into any fistfights today. The name and face may ring some bells if you’re a local—Miska gets around town as a musician in the “dancey” Americana band Bramble and its off-shoot, Wing and Claw, but he’s also a long-time bike commuter and good-time haver. Miska’s most recent bicycle journey led him to Reno, Nevada, where he took part in a casually epic 24-hour alleycat, the ScalleyCat 2014. 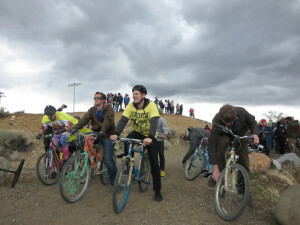 This annual scavenger-style event started in 2007 is the stuff of legend in Reno, drawing about 300 participants this year on April Fool’s Day in an event that Miska describes as the community’s heart and soul. “It starts at noon Saturday, goes till noon Sunday … Through the night you have hundreds of missions that are potentially completable, and it’s points-based, so therefore there is no race—everyone’s doing this for the same amount of time—it’s just how many missions you can complete,” says Miska. Rather than receiving the usual manifest of checkpoints, the teams are given a thick packet printed with themed spreadsheets listing a task and the number of points awarded for each one. These tasks range from having a tickle fight (300 points) to cooking and eating a piece of roadkill (5,000 points) and much, much more absurd, all documented via photos and video. Traditionally, an alleycat’s winner is determined by how quickly and efficiently the rider can navigate the city to hit every checkpoint and make it back before anyone else. The ScalleyCat ridicules those conventions by operating outside the box of a typical athletic competition—participants are essentially competing against their own boundaries. “It was as physically challenging as you wanted to make it,” says Miska, who admits the hardest part for him was staying up for 24 hours (he napped for a few). “For 95-percent of the people involved [they participate] only because it’s a blast.” Even the very first page of the “manifest” notes this event was organized for the solid reason of having a good time: “Thank you for being a part of how awesome Reno is. Just so you know this whole thing is a joke. Don’t take yerself too seriously. Have fun, it’s important, all the time. XOXO,” it reads. Miska wasn’t even sure if there was a clear-cut winner, though someone did go home with a giant trophy of handlebars stacked together and a cash prize. There won’t be any boundary pushing on these rides comparable to the ScalleyCat, but Miska’s insider perspective of the city promises to provide just as good a time with just as pleasant company. Keep up-to-date on the company’s progress and your chance to join in on a ride at saltlakebicycletours.com. Finding concrete information about the ScalleyCat is nearly impossible on the Internet—Miska explains that the event relies on word of mouth to draw participants, but their Facebook page has the very latest, if not scant, developments—just search for “ScalleyCat.” He’ll be attending next year, so buddy up if you want a friend who’s familiar with the best mid-race watering holes: “If you put me back in Reno right now on a bike, I could certainly find my way around just from memory,” says Miska.